The Cultural Landscape Foundation’s (TCLF) Leading with Landscape symposium offered a deep examination of the landscape of Toronto, which was described as a complex ecological system. The presence of Toronto mayor John Tory at the conference showed the importance local policymakers place on the landscape architecture community in shaping the future of this city, the fourth largest in North America. Mayor Tory spoke of balancing growth with social and environmental responsibilities, and the integral role landscape architects play in creating a sustainable city. The first of TCLF’s Modernism symposiums in Chicago sought to define contemporary landscape architecture by looking at its historical context. The second conference at the Museum of Modern Art (MoMA) in New York City championed landscape architectural practices that challenge rigid Modernist idioms through systems-based approaches, which cities increasingly need to deal with today’s complex environmental and social challenges. And the third installment, Leading with Landscape, called for responsive urban design based in a “landscape first” approach. The day-long conference focused the conversation on how cities — with Toronto serving as the host city and model — are created and sustained through landscape. The term landscape here refers to interconnected natural systems (geologic, hydrologic, botanical and zoological); the many interventions and manipulations of land by humans — from indigenous people to contemporary landscape architects, planners, and engineers; and the resulting street grid and consequent structures. Charles Birnbaum, FASLA, founder of TCLF and organizer of the conference, presented a chronological overview of the cultural landscape of Toronto, with specific examples from Allan Gardens to the post-Modernism of Yorkville Park. Birnbaum made a passionate argument for growing Toronto from its historic fabric. He spoke of the importance of context and narrative in the creation of authentic, resilient places, which can then generate the cultural and financial investments needed for a vital urban environment. Landscape architect Janet Rosenberg, FASLA, founding principal, Janet Rosenberg & Studio, and Michael McClellan, principal at ERA Architects, introduced some motifs that recurred throughout the conference: the idea of a multi-verse Toronto with many socio-economic layers that exist side by side, like the suburban high-rises next to the waterfront reality; and the major role of the city’s ravines, which structure the city’s hydrology. The ecological and cultural contexts that have shaped Toronto were further related by Nina-Marie Lister, Hon. 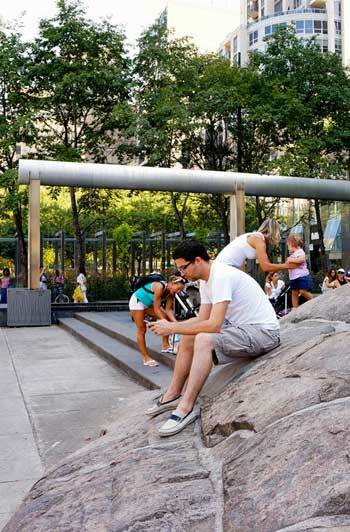 ASLA, associate professor, school of urban + regional planning, Ryerson University. Lister showed the transformation of the city’s landscape by geologic, hydrologic and human forces, and how the expansion and the demand for economic productivity eroded critical ecological services. In 1954, Hurricane Hazel led to devastating flooding in the city, which began a movement towards a hybrid-design approach that engages development alongside a deeper consideration of natural systems. 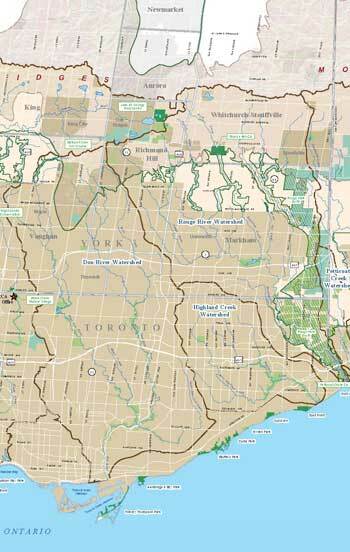 Brendan Stewart, ASLA, landscape architect and urban designer, ERA Architects, used early city maps to show the lot plans – Toronto’s original organizing grid — and the many subsequent layers and sub-divisions that occurred over two hundred years, which all eschewed the complexities of the existing ecosystem. 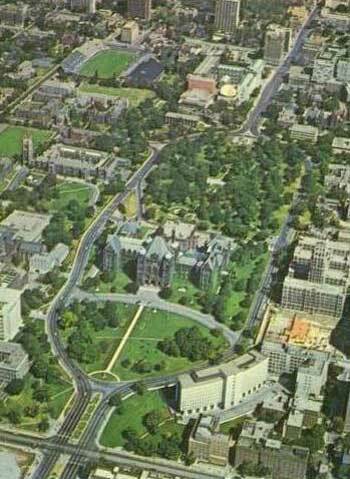 Stewart also explained the role of landscape architects in the development of the city — André Parmentier’s geometries at Queen’s Park and the University Avenue landscape being enduring examples. Like Lister, Stewart noted the increased awareness of Toronto’s natural systems following Hurricane Hazel, and the subsequent shift in the goals of the parks and recreation department. Today, the department is not only focused on providing spaces for recreation for residents, but also designing a park system that can provide a hydrologic structure to protect the city. Concluding the discussion of Toronto’s ecological and cultural context, Jane Wolff, associate professor, University of Toronto, presented a short history of coupled built and natural systems in Toronto, equal parts accident and intention. An example of this interplay is the bluff condition of the city that has “fed” the archipelago just off the shore of the city; the islands that formed are now an integral part of the cultural and ecologic fabric of Toronto. Another example, the Tommy Thompson Park – a spit created by the engineered redirection of the Don River – has become a flourishing ecosystem that now provides a stop for birds along their yearly migration. This guest post is by Tim Popa, Communications Director, Nelson Byrd Woltz Landscape Architecture.